This time round, the crew of the U.S.S. Enterprise return home from a troublesome mission just in time to see Star Fleet being attacked. The culprit is John Harrison (Benedict Cumberbatch), and soon the brash but eager Captain Kirk (Chris Pine) is tasked with leading the manhunt to take him down. 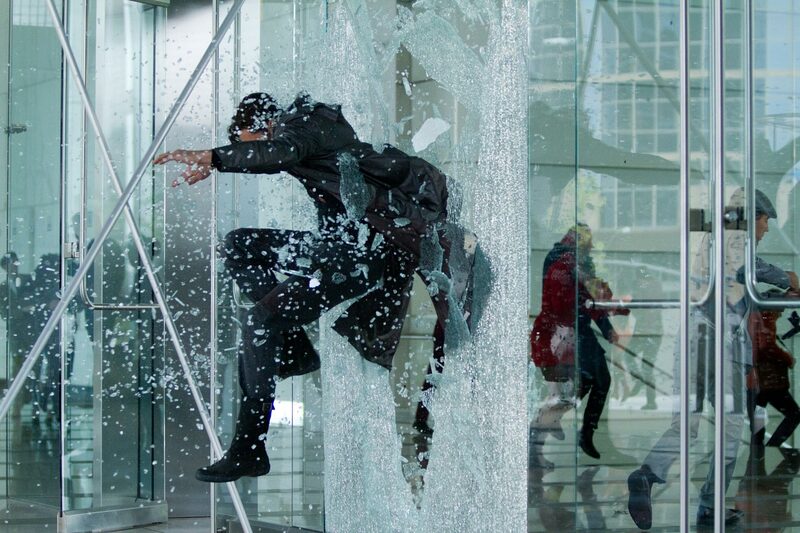 Much like the first film in the series, Into Darkness begins with an emphatic, attention-grabbing opening sequence. It proves to be a clear statement of intent, kicking events off at an energetic pace which rarely relents. Now that the origin story is out of the way and the characters have been introduced, Abrams wastes no time in delving deeper into his characters and their relationships, and the brilliant screenplay keeps the witty repartee coming thick and fast. That the narrative is constantly twisting and turning in the wake of well-executed revelations only makes the film more compelling. On the action front, Into Darkness is exceptional. The film is chockfull of exciting set-pieces; spaceship chases, space jumps, brutal skirmishes and much more are all thrilling to watch, and it is here where the film is at its most immersive. 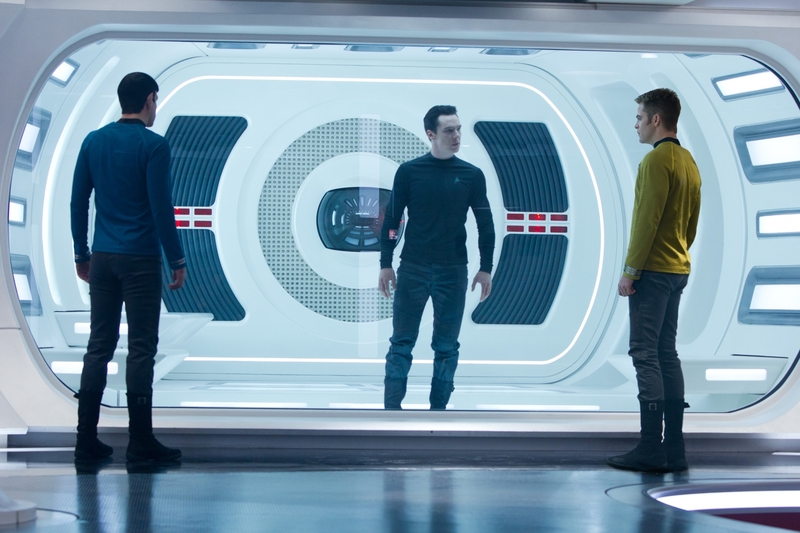 Once again, the bromance between Kirk and Spock – played with distinction by both Pine and Zachary Quinto – is at the film’s centre. The banter between the two beloved characters seems even more effortless here, and the issues of loyalty and friendship are all handled well. Whilst there are one or two crew members who are forgotten about (you’ll be wondering what happened to Anton Yelkin’s Chekov), for the most part the rest of the returning ensemble cast all make worthwhile contributions. Zoe Saldana in particular makes good use of her screen time, whilst Karl Urban and Simon Pegg deliver the bulk of the comedic dialogue with aplomb. 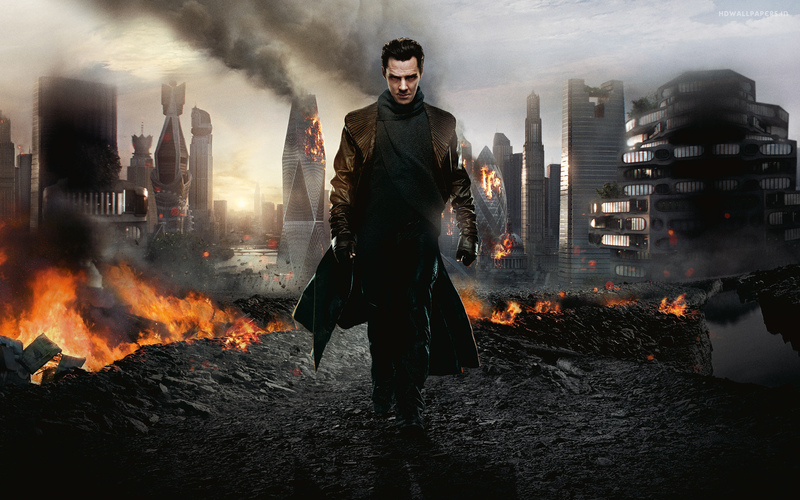 Without question however, the standout performance of Into Darkness comes from Cumberbatch. The Sherlock star is superlative as the villainous Harrison, and many of the film’s most memorable moments occur when he is on screen. Still, Abrams’ film is not without its flaws. Beautiful though she may be, a scene where Alice Eve’s character strips down to her underwear is incredibly gratuitous, and the manner in which the conflict is ultimately resolved in the final act is a little too neat. With that said, these foibles are easy to forgive. This entry was posted on May 10, 2013 by Amonymous. It was filed under Film Reviews and was tagged with Alice Eve, Benedict Cumberbatch, Chris Pine, J.J. Abrams, Karl Urban, Simon Pegg, Star Trek into Darkness, Zachary Quinto, Zoe Saldana. Reblogged this on Killing Time. Great review, Amon. Super excited about this one. I’ll be seeing it tomorrow!